A Phi Phi diving course gets you a qualification in safe diving on one of Thailand's most beautiful islands. 29 degrees warm all year round with some of the best diving reefs and the best above water scenery in Thailand, this is a fantastic location to get on a life long journey in diving. The main Phi Phi diving course available on Phi Phi Island is the world renown PADI diving course. The PADI diving course is used in virtually every diving resort throughout the world so becomes your literal passport to diving. This is great if you want to dive at Koh Samui in Thailand next week or the Great barrier reef in Australia next year. One diving course fits all. 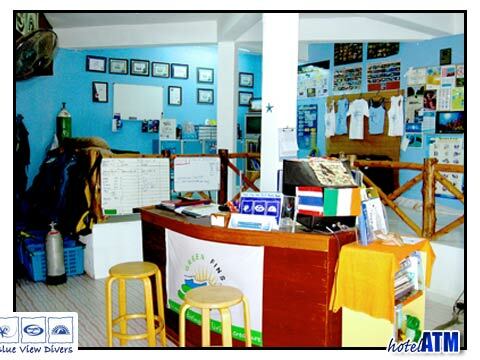 Phi Phi diving course can also be taken in the equivalent SSSI and this is chosen by many for one key advantage. It is cheaper to learn. The dues owed to PADI by the dive schools are more than SSSI so that the dive schools in Phi Phi can pass on this saving to the customer. The Phi Phi diving course that gets you to the Phi Phi Dive sites is the Open water qualification. This is a 3 to 4 day course broken down into modules that must be taken, tested on and passed before the final dive in the open water earns the diver the tag 'Open Water diver'. After the relevant paperwork is filled out and sent off to PADI in the USA you are sent a diving card that can be shown to any diver school around the world as your credentials. The 3-4 day Phi Phi diving course takes you through theory that explains what safe diving is, what unsafe diving situations need to be avoided, key underwater sign language, equipment use, taking care of equipment. The theory precedes the actual practice. Each day confined water is then used to go through all the diving techniques needed like breathing through the regulator, clearing the mask when it fills with water, keeping a stable balance in the water, how to descend, how to go up and more. The final days of the full PADI Phi Phi diving course take you out to some of the classic reefs off Phi Phi Ley island. Here you will go through those same techniques learnt ashore and in the confined water again but in the real situation of 15m-20m of water. The experience of going through the dive process and succeeding (which the vast majority do) is a wonderful feeling of satisfaction that last a long time. If you don’t have time for a 4 day Phi Phi diving course you might want to look at the Discover Scuba option that allows you to dive in one day. The discover scuba teaches you the key safety do's and don’ts and allows you an adventure you might not of thought possible. At the end of a discover scuba you cannot go to another school and expect to join a dive group as you would either need to do a new discover scuba or take the full open water course. So the discover scuba last just for the day whereas the Open water is for a lifetime. The price for a Phi Phi diving course is fixed at the beginning of the year. Price fixing is abhorrent to many but with the specific situation on Phi Phi and the style of normal business it was agreed that this is the safest way to run the industry. Why safe? We'll it's because diving requires a set investment in safety material which gets seriously and dangerously undermined by short-termism dive operators that drive the prices down in a price war. Further Phi Phi diving course information can be found at the Phi Phi Diving guide where you find articles on PADI Courses, Difference Between PADI and SSI, Learn to Dive on Phi Phi, Diving Discounts, Phi Phi Junior Open Water Diver, Phi Phi Dive Courses, Phi Phi dive schools with German, Japanese, Korean, Swedish or instructors and more.